At the same time, his proposal calls for funding transportation by raising the sales tax from 5 to 5.8 percent. According to McDonnell, this will be revenue neutral to start, though by 2018 the sales tax hike should bring in $180m more dollars. More money would be raised by increasing the vehicle registration fee by $15 and levying a $100 fee on drivers of hybrids and other alternative-fuel vehicles. He would also increase the share of sales taxes dedicated to transportation. To be fair, let’s look at the pluses. As I’ve written, the gas tax is a dying source of revenue because it is almost never indexed to inflation, is very rarely raised for fear of the wrath of voters, and will be eviscerated by coming improvements in fuel economy and alternate fuels. Something will have to be done to pay for transportation, and a shift to the use of sales taxes would put highway finance on a more dependable base. Politically, the idea has one major merit: voters have consistently demonstrated greater antipathy to raising the gas tax than the sales tax. In fact, when sales tax hikes are pitched as being dedicated to popular transportation projects, voters across the country have approved them at the ballot box. It’s unclear why voters seem to prefer higher sales taxes over gas taxes: perhaps it’s because a half cent sales tax increase just sounds like less than a five cent gas tax increase, although of course this may not be true since the former falls on a much broader base. In any event, McDonnell’s proposal may be a politically feasible way to raise badly needed transportation funds. The downsides of this? What’s the length limit for a readable blog piece? McDonnell proposes to decouple use of the transportation system from taxation to pay for it. In essence, this means raising taxes on those who drive little—or not at all—to subsidize those who drive a lot. This is a disturbing idea from an equity perspective, since unsurprisingly the wealthy are far more likely to own cars and drive lots of miles than the poor. The very poorest, of course, are unlikely to even own autos. Moreover, since the wealthy are able to save more of their income than the poor, sales taxes are regressive, with low-income individuals actually paying a higher share of their income than the better-off. This proposal is also troubling from the perspective of economic efficiency. The obvious reason is that it no longer provides a behavioral signal to discourage driving. Don’t get me wrong, auto travel has tremendous individual benefits, but as I’ve written in the past, collectively we overindulge in it because drivers create all sorts of costs that are borne by society and for which they don’t directly pay (e.g. pollution, congestion, much of the cost of accidents, and road damage). Slap a few curves on a graph, and it’s easy to see that society would be better off if we factored these into the price of driving. Ian Parry and Kenneth Small wrote a paper a few years ago where they attempted to calculate what America’s optimal gas tax should be, given these externality problems. They conclude that, in 2000 dollars, each gallon of gas consumed in the U.S. creates 24 cents in pollution costs (even using a very conservative estimate for the cost of CO2 emissions), 32 cents in congestion costs, and 27 cents in accident costs not borne by the driver. The authors conclude U.S. gas taxes should be about $1/gallon, more than twice what they are now. It should be noted that the gas tax is not the ideal way to address these externalities; as Parry and Small point out, it is a blunt instrument for dealing with congestion since it does not fall on those who create the most congestion by driving on the most congested roads. Direct tolling on the most in-demand facilities would work better. Moreover, some of the positive effects on road wear, accidents, and congestion would be lost because consumers can and do respond to increased gas taxes not only by driving less but by driving more fuel-efficient vehicles. This brings us to the most curious aspect of McDonnell’s proposal. It is true that more fuel-efficient vehicles, particularly those which run on alternate power sources like electricity, are eroding the gas tax take and will do so dramatically in the near future. From the perspective of the environment, it is not a bad thing that people are driving greener cars. However, a Nissan Leaf driver is out there creating congestion and accidents and wearing out the roads, without paying for it, and perhaps he should in some form. But not only does McDonnell’s proposal add a surcharge for hybrids and EVs, it eliminates the state gas tax simultaneously. How would this affect a light-driving Prius owner versus a Range Rover driver who logs twice the miles? By my back-of-the-envelope calculation, the Prius owner’s savings in sales taxes on gas are dwarfed by the annual hybrid fee. In fact, the thirsty Range Rover would have to be driven about 90,000 miles a year to make it balance out. Do we really want to be implementing a tax policy that forces the Prius owner to pay for the Range Rover’s travel? So what’s the solution? Most transportation experts agree we should be looking at “first-best” policies like tolling of congested facilities, or a general tax on miles traveled. I have some doubts about the political feasibility of these, particularly the latter: if we have trouble getting the public to accept small gas tax increases, will we be any more successful at persuading them to agree to new and more invasive forms of pricing? Also, both of these methods will cost far more to administer than the gas tax, which is extremely simple and cost-effective to collect. y be in terminal decline, there is no reason for us to practice euthanasia. Let’s hike, not lower, it while we explore new forms of finance. This doesn’t seem unreasonable since Virginia, for example, it is bringing in 45 percent less in real terms than it was when the gas tax was last increased 27 years ago. Ultimately, doesn’t it make more sense to tax things we don’t want—like excessive driving and poor fuel-economy—as opposed to taxing general spending, which, given current economic conditions, we’re trying to promote with ultra-low interest rates? Bob McDonnell, have pity. Please retract this proposal and stay away from the other governors at the annual Governor’s Association cookout. Let’s follow in the path of that well-known leftie communist sympathizer Ronald Reagan, who saw the gas tax not as a tax but as a user’s fee and signed an increase into law. And please free me to focus my patience on tolerating other daft proposals like crisscrossing our cities with networks of subterranean toll tunnels—oh wait, that’s my daft proposal, and it might not be as daft as it seems. More on it in another post. I haven't heard anyone propose a tire tax. Tire usage is very proportional* to miles traveled, I think more so than gasoline. If a tire lasts for 40,000 miles and you want to raise 1 c/ per mile, then $400 tax for a set of tires sounds about right. * I've heard the story but don't know how true it is. During the war when we had gasoline rationing, we weren't actually short of gas. We were short of rubber but didn't want the Germans to know that because they could have cut off our supplies so easily. So we indirectly rationed rubber usage by directly rationing gas. This would lead to people pushing the limits of their tires, resulting in a lot more tire blowouts on the roadway. Blown out tires can cause cars to go out of control and lead to accidents, or at the very least result in pedestrians needing to leave their vehicle in close proximity to the roadway to change to a spare. Neither of these situations are safe, and we shouldn't implement a policy that will likely increase these instances. I agree that this is a negative. But I don't think it's a killer negative. Most states already have safety inspections and at least one tire manufacturer has talked about (actually introduced?) tires with orange wear bars to make end-of-use more visible. McDonnell proposes to decouple use of the transportation system from taxation to pay for it. In essence, this means raising taxes on those who drive little—or not at all—to subsidize those who drive a lot. Those who drive little personally still benefit from the transportation system, particularly from its use to provide goods and services to them. Yes, but those transportation costs are already figured into the retail price. Adding a transportation tax into the sales tax would be a form of double-taxation. Not that a lawmaker would care, of course. What if the registration tax was based on mass of the vehicle? Heavier vehicles do more wear and tear and have far more costly accidents. Maybe a formula of mass and miles to charge vehicles. My Miata doesn't do nearly as much damage to the roads as the Land Rover you referenced above. The other poster here had a good idea with the tire tax, and make it progressive so that tires for larger vehicles have a larger tax. This is the correct answer or close; the formula for road wear depends on distance traveled (linearly) and on the fourth power of the weight per axle, so much of the road taxes should be applied by that scale. Understand that lawmakers have great control over their own income and expense accounts (including social systems and programs) through taxation. As they raise minimum wage so do retail prices increase. Moving any taxes over into the sales tax arena effectively ties that income to inflation (Labor costs+Material and other overhead+Profit+Taxes=Retail Price). Quite a sneaky move to consider this, Mr. McDonnell. But then few people fully understand the impact of mandatory labor rates as they affect inflation, and how increases in those labor rates also increase the government coffers through higher total sales tax and income tax revenues. I propose that all new cars be fitted with a device installed by the government that tracks miles travelled and emissions produced. The car would automatically send the government a report of this data via the cellular phone system approximately once a year. The government would calculate taxes based on this data through a simple formula and add it as a charge to the vehicle registration fee. Drivers who have the device installed would be exempt from gas taxes. Gas stations would have a device that could communicate with the device and confirm it is there and working. Drivers would like this because gasoline would be cheaper for them. Who doesn't like cheaper gas! Customers would mind the higher registration fees less. This allows the government to collect taxes based on the usage of the roads as measured by mileage (you could even have a formula that accounts for the weight of the vehicle. Many states already require smog checks. We would add to that check verification of the tracking system. They could also update the government's reading of the data in case the cellular update system fails. We could also allow people with privacy concerns who don't want the device to go to these places to have their mileage and emissions records read. I also propose eliminating the registration stickers on license plates. With automated license plate readers cops can do a scan of the plate and quickly determine if taxes have been paid. This might be considered very intrusive, but I'd even suggest that the monitoring device record how much time was spent on city vs county vs federal roads so that the money could be directed to the correct government based on the proportion of time spent driving on their roads. I once took Amtrak from Davis, CA to Richmond, CA. I had an entire train car to myself. The cost to society, per passenger-mile, of this trip must have been very high, and my ticket certainly wasn’t cheap. Why don’t we reduce ticket prices for train travel until all the trains are full? Even better, make train travel free and add more trains so long as they are full. Depending on elasticity, this might require additional government subsidies, but it would reduce the cost to society per passenger-mile of train travel below that of auto travel, which would provide a net benefit to society. In an earlier Freakonomics post, you clearly disagree. What am I overlooking? I realize that my proposal might increase the amount of travel consumed compared to other activities that have lower societal costs. If that is the case, we could achieve the same effect by taxing other forms of travel (for example, by raising the gas tax to a dollar a gallon) until the trains are full. I'd really question one of the starting premises, that voters have demonstrated a great antipathy towards raising gas taxes. Gas taxes are AFAIK not frequently subjected to votes, while sales taxes are (at least hereabouts). Here in New Zealand we tax petrol (gasoline) much like the USA but at a much higher rate. 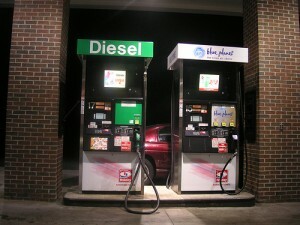 Diesel, however, attracts a much smaller tax (or none, I don't remember) at the pump. Rather, when you renew your diesel vehicles registration annually you provide the odometer reading, and pay Road User Charges - a tax based on the number of kilometers travelled. The reason for this is basically an accounting treatment which I wouldn't think too hard about - essentially diesel vehicles are used for a lot of exempt activites like tractors and generators on the farm, and we don't wish to tax these activities. But the upshot is that we have a system in place presently that allows the government to tax based on mileage. It works well here and I see no reason it couldn't work overseas. So how many people simply disconnect the odometers for part of the year? I note that Governor McDonnell is a Republican. He is pushing a bill that will help suburban and rural residents, who drive a lot of miles, at the expense of urban dwellers who tend to drive less and/or take transit. And a special tax on hybrid drivers, who are more likely to be lefties, must sound truly poetic to the Governor's staff. Why does the governor of Virginia want to make fuel cheap for out-of-state motorists, especially over-the-road trucks? Those vehicle registration fees aren't paid by the thousands of people who live just over the border but work in Virginia.